Father’s Day always poses a dilemma: “What can I get my Dad that he hasn’t had many times before?” Thank goodness, then, for our Fred Perry sale. The ultimate “Lads ‘n Dads” brand, Fred Perry’s heritage menswear offers a tried and trusted gift for the Old Man — timeless styles given a modern-day twist. 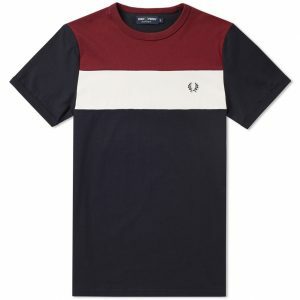 We’ve picked out 4 affordable and stylish Fred Perry sale garments to bring a bit of retro joy to your Dad this Father’s Day. Use the offer code “FATHER17” for 10% off all Fred Perry gear this Father’s Day! This sports-style T shirt is perfect for Dads who like to keep it simple. 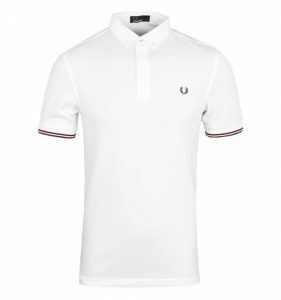 The plain, vintage design features the iconic “Twin Tipping” effect on the neck and cuffs, a style pioneered by British tennis legend Fred Perry. The garment comes in five superb colours, including three brand new colours for High Summer 2017. We prefer the Clay Marl T shirt with White and Burgundy tipping (pictured), but make sure to browse for that perfect colour combo. A real highlight of our Fred Perry sale. This glorious polo shirt is a bold statement of quality. 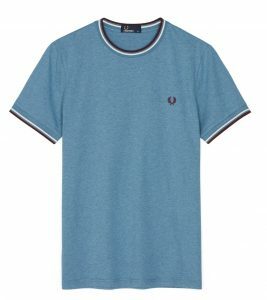 Its standout feature is the wonderfully soft pique cotton fabric, as smooth to the touch as anything in our Fred Perry sale range. Unlike their standard polo shirt range, this garment boasts an Oxford-style woven collar and a hidden 3-button placket, resulting a smarter, sharper look. The back features a box pleat and a twin tipped tab. Also available in Navy and Dark Carbon Oxford. Every year, we’re always delighted by how Fred Perry manages to innovate with classic styles such as T Shirts and Polo Shirts. This colour block T shirt has sold remarkably well since hitting our shelves in April. It’s easy to see why — the striking cut-and-sewn panel design stands out from run-of-the-mill T shirts. If you like the style but want a brighter look, try the version in Snow White. Show me a Dad who doesn’t love a check shirt! 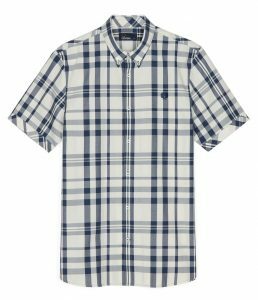 Fred Perry prize attention to detail with this button-through number, with a fine basket weave making the most of the quality 100% cotton fabric. There’s a trim detail on the cuffs and a matching check placket, showing that a simple colour pattern can be tweaked for maximum style. Perfect with a pair of summer jeans. Use the offer code FATHER17 for 10% off Fred Perry sale gear this Father’s Day!